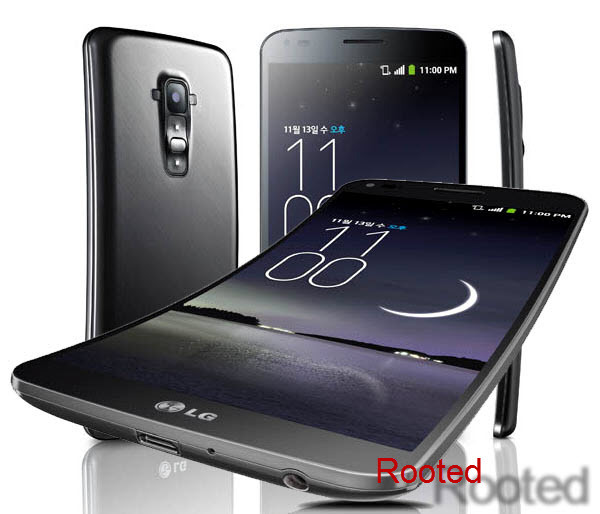 The rooting for LG Flex smartphone, which was launched in December, is finally possible. LG Glex is a 6-inch smartphone, which stands itself as competitor of Samsung Galaxy Note series, but at huge price. The LG Flagship device, G Flex boasts of a bendable design and curved display, which makes it a unique concept smartphone. The display has vivid colors, with just 720p resolution, but it could be 1080p for better visuals on this OLED display. The device is ultra-light and ultra-thin, and flexible; it runs on Android 4.2 Jelly Bean OS, coupled with Qualcomm Snapdragon 800 quad-core processor along with 2GB of RAM. Unlike most of the smartphones, LG G Flex has power key on back side, and its 13MP camera can capture 1080p resolution. If you bought the smartphone, and also interested in custom builds, then you should root it firstly. XDA member ‘autoprime’ has posted a method, in which he made a script which offers one-click rooting of LG G Flex device. He actually upgrade it’s well known ioroot toolkit with the support of latest Android firmware devices, including LG G Flex smartphone. Rooting certianly without any doubt voids your devices warranty and AndroidWeblog.com in no way will be held responsible for warranty void or your bricked device. You must enabled the phone to charging only mode, and to Ethernet mode in case of Verizon LG G Flex. Latest version of ioroot must be downloaded. Download Link. LG USB Drivers needed to connect smartphone to computer. Download Link. Step 1: Make sure that you’ve downloaded everything mentioned in Pre requisistes section above, and then have data cable in your hand, and connect your phone to computer after enabled USB Debugging option, as suggested earlier. Step 2: Now, extract the zip file ‘ioroot’, and then open the ioroot folder, and look for the file ‘root.bat’ and run the same, which will open the cmd (Command Prompt) Window. Step 3: The cmd window will ask ‘Press any key to continue’, and just do the same. Step 4: Now, rooting exploit script will run and the SuperUser will be installed in the smartphone. Step 5: As the process takes hardly 2-3 minutes, after successful completion of the process, the LG G Flex will be reboot automatically, and after the device gets reboot, you will see that device has been rooted. Note: You can check whether your device has been rooted or not, using the ‘Root Checker’ app which can be downloaded from Play Store. You can confirm the same, also simple way, just check that SuperSU app is there in your phone’s app drawer. Now, enjoy installing any Custom ROM and other apps which require root access.